Telangana MJPT BCWREIS Jr Lecturer Guest Teaching Faculty Online Application Apply Last Date 18-08-2016 at Official website mjptbcwreis.cgg.gov.in. TS MJP BCWREIS Junior Lecturers/ JLs Recruitment 2016 in BC Residential Junior Colleges invite to Online applications. 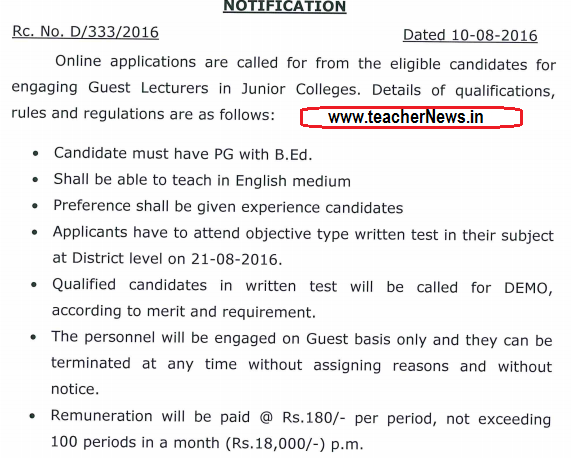 TS BC Residential junior college Junior Lecturers recruitment 2016 Notification. How to apply Telangana BC Gurukulam Junior Lecturers Posts Online Application. Mahatma Jyotiba Phule Telangana Backward Classes Welfare Residential Educational Institutions Society (MJPTBCWREIS) Junior College Engagement of Teaching Staff Guest faculty. Who are Eligible and interested candidates to work on temporary basis as full time guest faculty in TS BC Residential Junior Colleges for Academic year 2016-17. Online Applications Apply at official website http://mjptbcwreis.cgg.gov.in/. Monthly Salary Rs. 1800/-, 100 Periods Rs. 180/ per Period.